SICHUAN in China is often dubbed the “heavenly country”, mostly due to its surplus of natural resources and good food. It has been said that Sichuan cuisine is made of seven basic flavours ” sour, pungent, hot, sweet, bitter, aromatic and salty ” and one ancient Chinese account said that the people of Sichuan uphold good flavours in their cuisine. These diverse flavours are the result of the combination of unique local ingredients used in preparing Sichuan cuisine. However, one does not need to travel 3,500km to Sichuan to enjoy its cuisine as Parkroyal Kuala Lumpur’s Si Chuan Dou Hua Restaurant serves up authentic dishes in a fine-dining setting. Among the chef’s recommendations at the restaurant are the Deep-Fried Prawns with Spicy Sichuan Peppercorn and Butter Prawns with Oats. 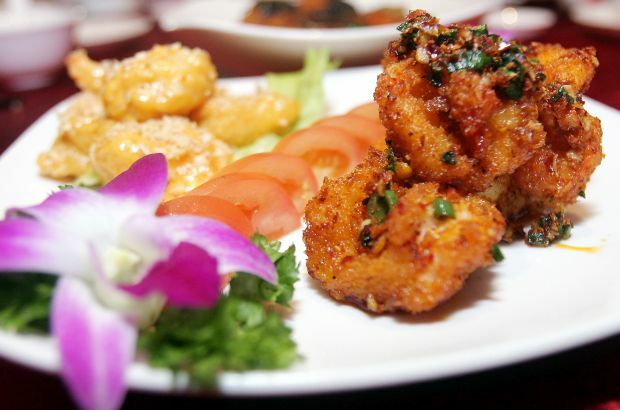 Every deep-fried prawn explodes with traditional Sichuan flavours. The ingredients were flown in from Sichuan, hand-carried by the chef himself. For those who are new to Sichuan fine dining, the Braised Dry Oyster, Sea Cucumber and Black Mushroom with Black Moss Vegetables is a good seafood dish that serves as an introduction to the region’s tastes. From Jan 18 until Feb 24, the restaurant invites guests to try a series of special set meals prepared by Chinese chef Chew Chee Kuong and Sichuan chef Wang Yunghai. Si Chuan Dou Hua also offers a variety of speciality yee sang creations, including its signature Tropical Fruit Yee Sang which consists of sliced kiwi fruit, dragon fruit, mango, strawberry, apple and pomelo. The yee sang is served with a choice of specially-invented sauces such as sour plum sauce enhanced with fruit, spicy plum sauce with mango or the traditional sour plum sauce. Chinese New Year set menus are priced at RM798 for four people and RM1,030 for six. For larger groups of 10, there are the Prosperity, Fortune or Wealth set menus priced at RM1,158, RM1,390 and RM1,622, respectively.